If you want to go somewhere to avoid mosquitoes, you’ll have to go all the way to Antarctica, the only area of the world where mosquitoes are not found. Not only are mosquitoes everywhere, they’re also more diverse than scientists can keep up with. At 3,000 mosquito species and counting, scientists don’t even agree on how mosquitoes should be classified. However, scientists do agree that close to 200 species of the blood-sucking insects are found in North America and Mexico with the most common U.S. mosquitoes being the house mosquito, the southern house mosquito, the yellow fever mosquito, and the Asian tiger mosquito. About a dozen species of the culex can be found in the United States. They lay their eggs (a hundred or more at a time) in pretty much any type of quiet water from storm drains to birdbaths to lakes to sewage cesspools. The house mosquito bites humans and animals (mostly at night) and can carry deadly diseases. The Culex fatigans can be found in tropic and sub-tropic regions. Another night feeder, the Southern mosquito bites at night and can transmit both West Nile virus and St. Louis encephalitis virus. The adults don’t travel much, and as their larvae need stagnant water, they take up residence near houses with a ready supply of standing water. Old tires, toys, and gutters are excellent collectors of water and favorite breeding grounds of the Southern house mosquito. The yellow fever mosquito has a deadly history, transmitting the yellow fever that killed more U.S. troops during the Spanish-American war than the actual war itself. The mosquito came from Africa, and now makes its home most commonly in Southern Florida and coastal cities of Texas and Louisiana, although it can be found all the way up the East Coast to New York. A competitor with the Asian tiger mosquito since the 1980s (when the Asian tiger mosquito first arrived in the U.S.), the yellow fever mosquito’s population is declining as the Asian tiger mosquito population grows. 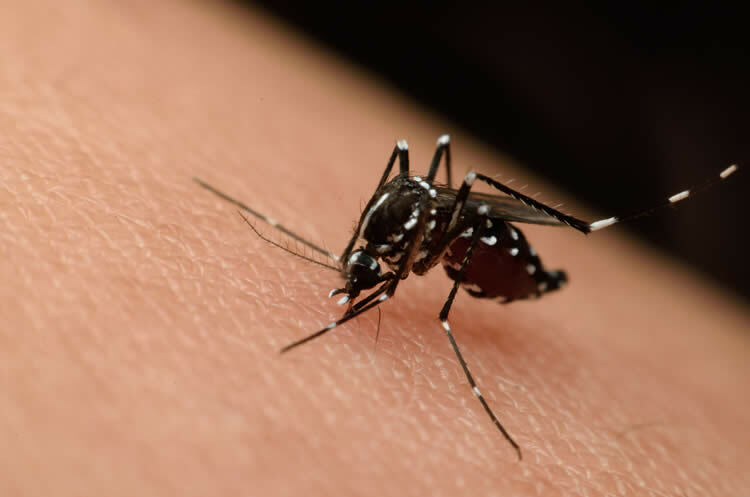 The yellow fever mosquito thrives in stagnant water around cities and homes, and bites in the mornings and late afternoons, preferring people over animals. And you thought mosquitoes only bite at dawn, dusk, or night. The female Asian tiger mosquito, unfortunately, is a daytime biter and very aggressive. And since they arrived on the U.S. scene in 1985, Asian tiger mosquitoes have been competing with (and beating) the yellow fever mosquito for rights to habitat. Unlike the house mosquito who doesn’t care about things like cleanliness, the Asian tiger mosquito prefers clean, standing water. They’ll make your birdbath or flowerpot into a nice nursery for their larvae. Like the Southern house mosquito, Asian tiger mosquitoes won’t travel far, traveling only a half mile from their original breeding sites. The Asian tiger mosquito transmits more than 30 viruses, but most do not affect humans. However, your dog could be in danger because this species transmits heartworm. All four of the most common mosquitoes found in America breed in standing water, so one of the best ways to prevent mosquitoes from invading your yard and home is to remove any standing water on your property. If you notice that mosquitoes still don’t stay away, hire a reputable mosquito control company to take care of the problem for you.